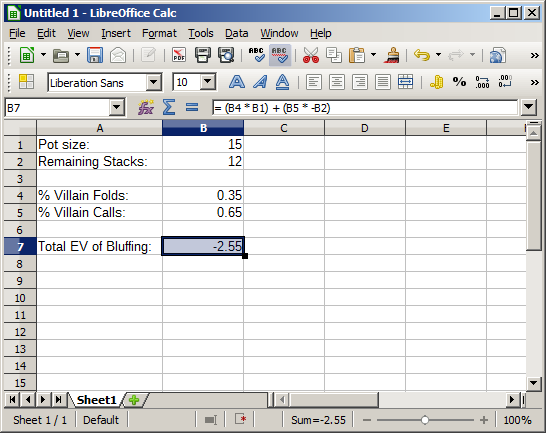 A few weeks ago, I promised a series showing how to study poker using spreadsheets. This week, we start that series. There are some prerequisites that you’ll need to have under your belt before you can get started with this series. First, you need to work through the EV Calculations Tutorial series. To make it easier on you, I’m going to provide links to each of the six parts of that series here: Part 1, Part 2, Part 3, Part 4, Part 5, and Part 6. This spreadsheet series is going to be an application of what’s learned in that series, so make sure that you understand it before going forward. You don’t need Microsoft Excel to make spreadsheets that will work for what we’re doing here. You have a few free options. I prefer LibreOffice which is an open-source office suite that works pretty well, and my screen shots are going to be from that. You can also go with the spreadsheets option from Google Docs if you want a web-based option. There are probably other free spreadsheet program choices out there, so feel free to do your own research on what you want to use. We’ll only be using basic formulas with this series, so everything should work out no matter which program you choose. 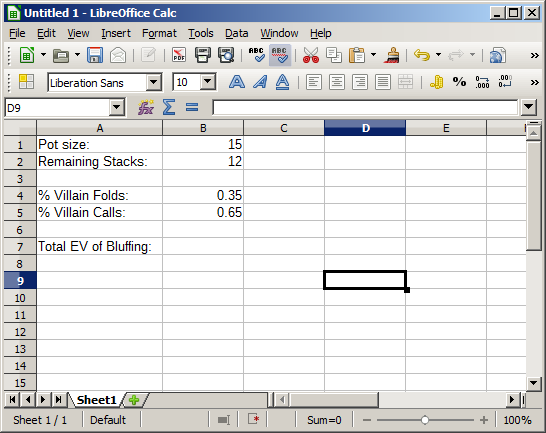 We’re going to start out by creating a spreadsheet to look at a basic bluffing scenario. Suppose that we’re heads-up in position and our opponent has checked to us. The pot is $15 and we have $12 behind, and we expect our opponent to fold to a shove about 35 percent of the time We want to evaluate the EV of shoving all-in as a pure bluff using a spreadsheet. To be able to do this, we need to create some cells on our spreadsheet to include the relevant information. Villain folds. We win the pot. Villain calls. We lose our bet size. Once you have this set up, then you’re good to go. We can start analyzing this situation in more detail by testing different values. The advantage of using a spreadsheet like this to analyze poker situations is that you can plug in different values right away without having to do all of the math over and over again. 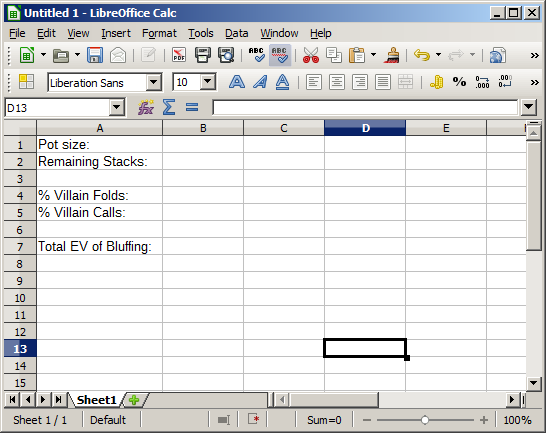 Let’s look at a quick example using the spreadsheet that we just created. When the bet size is $12 and the pot size is $15, we know that a pure bluff needs our opponent to fold 12/(12+15) = 44.4 percent of the time to be profitable. If our opponent folds 45 percent of the time, we should just barely be profitable. To test this, we need to put in 0.45 for our opponent’s fold percent, and don’t forget to change our opponent’s call percentage to 0.55 as well. If you make these changes, you’ll see that cell B7 automatically updates by performing the calculation so that you don’t have to. You can change the pot sizes and bet sizes as well as the percentage of the time that the opponents calls and folds. Try out different values to see what happens. To know whether we should bluff or check in this situation, we need to know how often we’re going to win if we check behind. Try to update this spreadsheet that we created this week to calculate the EV of checking in this scenario so that you can compare the EV of each of your options at the same time. Next week in part 2 of this series, we’ll look at how to add the EV of checking, and we’ll also look at some other shortcuts that will make things easier on you as we push forward into evaluating more difficult scenarios.